So, I'm finally moved in, after what's seemed like an eternity of living a half-life: scrounging for my own possessions among shambles of disorganized boxes (no one to blame but myself). Of course, now I'm just rummaging for my clothes in somewhat more orderly boxes, but I've cooked in my new apartment a few times now, and that's when a place feels like home to me. My new home has lots of potential for gardening (er, of the front porch variety, that is) and is just a few blocks down the street from the weekly community market, all of which means lots of fresh produce in my recipe experimenting future! Of course, now that I'm semi-settled, the first thing I really want to make is some fatty, un-fresh, un-healthy comforting, chocolately summer goodness S'mores bars. I've had a huge craving for S'mores lately, most likely due to the unbridled placements of S'mores fixins in the most in-the-way places in the grocery store. I'm talking about chocolate bars, graham crackers, and the angelic fluffiness of pure corn syrup marshmallows. Every time I go to the Ray's or Safeway with a mind set to a healthy dinner for Caleb and I, I am bombarded by S'mores fixins, so of course I'm craving them! Sheesh. It is summer, after all. 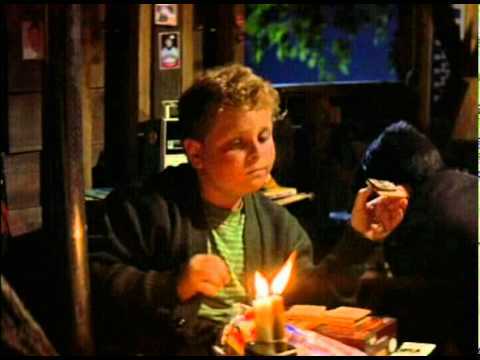 Now, here's the thing, when I think of making S'mores, I always harken back to my childhood and recall the careful advice and instruction of Hamilton "Ham" Porter. If you've never seen The Sandlot, then, oh goodness, please make this S'mores Mess then, as it cools, hunt down a copy and watch this movie pronto. It's the epitome of summer kid movie, with an elegant smash of timelessness and characters who are champions of youthfulness and innocence. It's sooooo good (just like these bars). 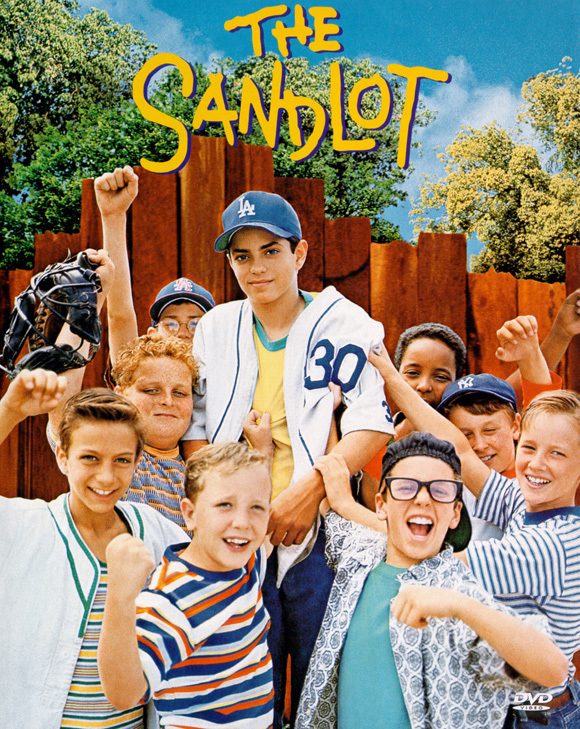 No summer, or childhood for that matter, is complete without a couple of "You're killing me, Smalls" or Wendy Peffercorn references (oiling and lotioning). Ok, now that we have that out of the way, I'd like you to read this recipe in your head with the immortally condescending voice of Ham Porter, as I always do. Also, I should mention, this recipe is different from other S'mores bars recipes in its gratuitous chocolate to cereal/mallows ratio, and the fact it's not really a bar. I call it a S'mores Mess rather than S'mores bars because I am unable to make these kinds of marshmallow things without making a gigantic sticky mess, with little resemblance to bars in shape or form. First, in a large pot, melt the butter over medium-low heat. Toss in the 'mallows and stir them constantly so they don't burn to the pot. Keep stirring until they're fluff-ily smooth. Then you toss in the chocolate. Now, this is where I diverge from a lot of other recipes. Most say to preserve these to the very end, so they don't melt into the mallows. But then it's not crazy chocolately, which is what I'm really after. However, if you are persuaded by the visually attractive and wish your bars to be so, by all means, withold the chocolates until the very very end (follow the * to the end of the recipe). I throw them in with the warm mallow, though, with the full intention of getting a huge chocolately mess. Keep stirring, too, until you have the mallow/chocolate mixture rate you desire. Next, lower the heat to low and fold in the cereal about a cup at a time, but do it quickly. 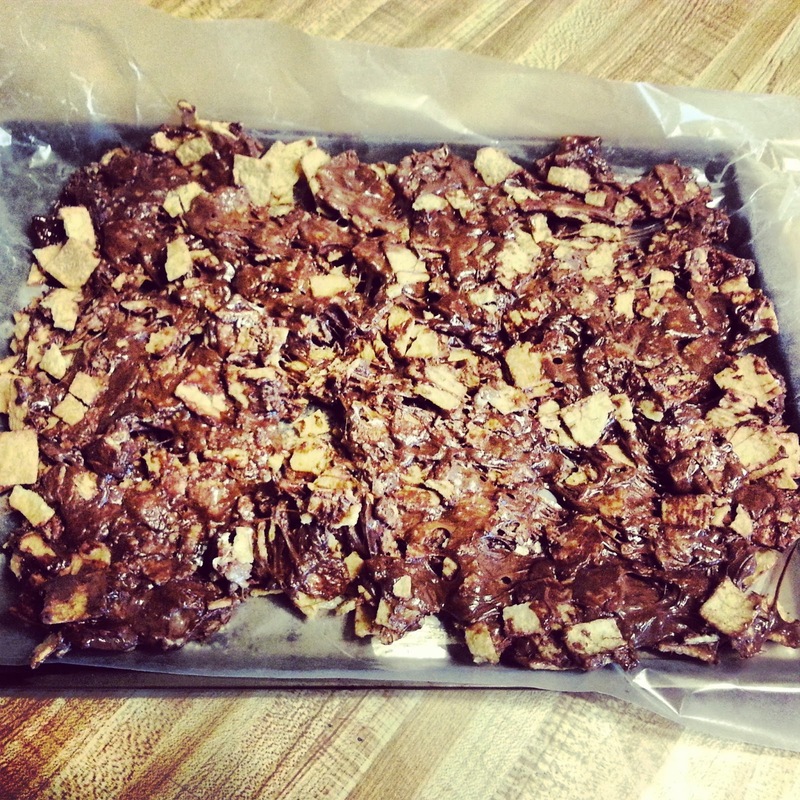 When the cereal is all combined, pour your mess into a baking sheet lined with wax paper (*here is where other recipes will suggest you sprinkle your chocolate chips over the warm mallow-cereal). Spread it out thin and allow it to cool completely. You might actually want to stick it in the freezer or the fridge for a bit if you're impatient (like me). Then use a pizza cutter or a sharp knife to cut the mess into bar-like shapes, maybe.